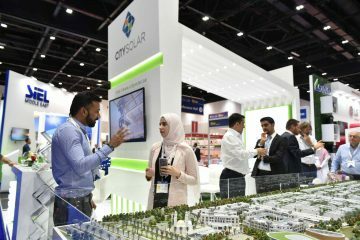 Thousands of visitors are expected to attend Middle East Concrete (MEC) and PMV Live 2016 at the Dubai World Trade Centre this week, as the show was officially opened this morning by H.H. Sheikh Hamdan bin Rashid Al Maktoum, Deputy Ruler of Dubai. Co-located with the Big 5 2016, the region’s biggest and most prestigious infrastructure and heavy machinery event features 430 exhibitors and over 50 CPD-certified and free-to-attend forums, workshops and seminars delivered by industry experts, as well as a fun-packed action zone bringing a fun element to the four-day event. 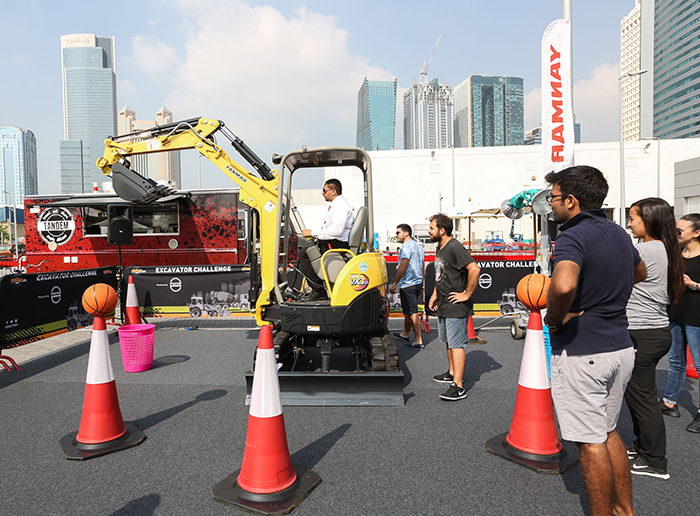 The Excavator Challenge, hosted by M. H. Al Mahroos, was a firm favourite with visitors this morning as they raced against the clock to play basketball using an excavator. 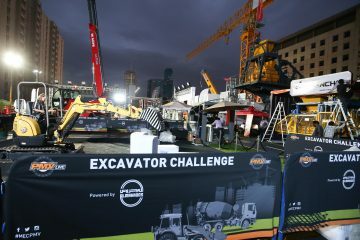 “The leaderboard shows those with the quickest time in the excavator challenge and it’s great to see so many people enjoy the spirit of competition while they get to know the workings of the machine,” said Talal Al Mahroos, Marketing Manager at M. H. Al Mahroos. M. H. Al Mahroos are also showcasing the latest Vibration Roller (MRH-700) from Japanese Mikasa as well as other high quality, innovative construction products by Yanmar, IMER, Genie, ALKO and Trailer Rims. The crowds cheered on Inter Equipment’s Guinness World Record holding Skip Loader as the handler attempted to perform tricks and spin into a new world record. Located at the dedicated action zone outside Za’abeel Halls 4-6 at stand OS105, the Lonking CDM 312 Skid Steer Loader has the duration of the event to try and beat its previous record. DigiRobotics, the official KUKA system partner in the Middle East & North Africa (MENA), is also in the Action Zone at MEC and PMV Live 2016 hosting a demonstration where visitors can explore how robotics and 3D printed technology is used to in industrial applications. 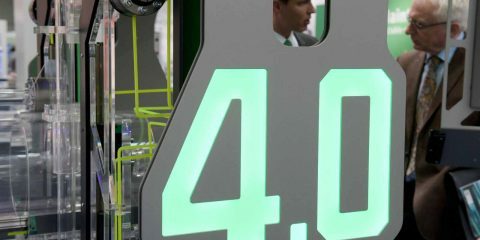 Visitors can see mobile heavy duty platforms used as transport systems for internal logistics, see metal cut at fast speeds and with versatility for cutting curves and angles and watch how laser beams use a thermal process to enable precision cutting. Industrial robots usage is predicted to increase by 30 per cent by 2020 in GCC countries with a large percentage used on construction projects. 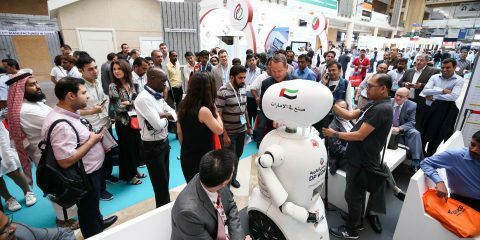 In the GCC, DigiRobotics customers that use robots in manufacturing include Doha National Museum, Al Forsan International Sports Resort, Extension of Khalifa University, King Abdullah Petroleum Studies and Research Center in KSA, among others. MEC and PMV Live 2016, which runs until Thursday 24 November in the new Za’abeel Halls 4-6, Dubai World Trade Centre, also includes demonstrations of concrete stamping techniques in the Decorative Concrete Zone where visitors are treated to a masterful show on how concrete is beautified and used for decoration and function. The event’s educational element, in which attendees can get certified into the latest trends, innovations, and business opportunities and benefit from over US$ 250,000 worth of educational content, included solutions to rebuilding and prevention against natural disaster, tips to buying and selling construction equipment, concrete sustainability and green concrete, as well as how to manage BIM for concrete construction. Visitors at MEC and PMV 2016 were also treated to a complete overview of the construction, machinery and infrastructure sector as they explored thousands of concrete and machine-related products including Accessories, Wear Parts & Components, Construction & Commercial Vehicle, Earthmoving Equipment, Lifting Appliances & Conveying Systems, Pumping Equipment & Accessories, Steel Fabrication Machinery, Site Installation Equipment and Truck Mixers, from more than 400 leading brands. Caltex Lubricants, Platinum Sponsor of the event, has over 75 years of experience in manufacturing finished lubricants with premium base oils to deliver excellent, reliable performance in a wide range of operating conditions. Lubricant products are marketed under the Caltex master brand in the Middle East, Pakistan, Africa and Asia Pacific with Delo® the product brand for commercial, industrial and some marine applications and Havoline® for passenger vehicles. Middle East Concrete and PMV Live will continue on 22-24 November 2106 at the brand new Za’abeel Halls 4-6, Dubai World Trade Centre, and is open daily from 11:00 – 19:00. 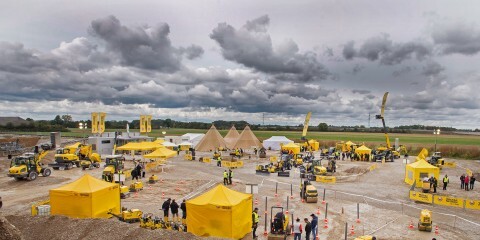 Please visit www.middleeastconcrete.com and www.pmvlive.com for more information.